What helped you in beating CPTSD? Hi guys! I hope you are all well. Before I begin I have to note that I cannot receive any treatment for PTSD and/or depression (my insurance does not cover mental illnesses), so I'll have to row with the oars I have got. I was wondering if you had some tips or expeciences that helped to "recover" from PTSD (I guess the scars will always remain, but I at least want to close up some wounds). I for example found that drawing helps with my anxiety. Are there any other things that may help? Now my biggest issue is 'people'. I am extremely awkward with new acquaintances and have commitment and trust issues. I have been friends with some amazing people for many years and still to this day do not feel at ease with them. I do not like hugging, being touched, showing my emotions, etcetera. I know that they notice me being distant and that new people think I'm odd. No one besides my family knows anything about my past, depression and PTSD because I should then explain what happened. I'm just not ready (and probably never will be) to tell them. Have people been experiencing the same things? What helped you in handling people and socializing issues? English is by the way not my native language, so excuse me if I made some grammar mistakes. 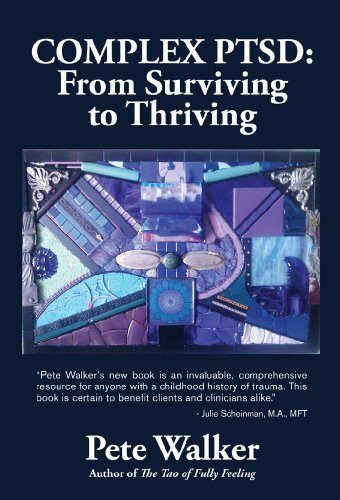 Re: What helped you in beating CPTSD? Welcome to PC & The Complex-PTSD Forum. I also find interaction with people to be very difficult due to trust issues and am not sure if I'll ever be able to completely overcome it or not ... But I do keep trying, and that's all any of us can do. I hope you find this site to be supportive and helpful too! Yes I have the same issues and haven't learned how to overcome them fully yet. However I'm slowly learning coping skills and mindfulness that help me feel more relaxed which I guess will eventually lead to feeling better with people. Definitely, taking up new hobbies is helping in small talk! Going for walks in nature (my new hobby) made it possible to practise small talk with random tourists. Usually people who walk in the forest are friendly and calm and in good mood. Once I couldn't cross a tiny damaged bridge over a stream and a complete stranger offered to help me and he held my hand. It felt very awkward and weird since I absolutely hate being touched. But he was so nice and relaxed and "normal" about it that I agreed. I felt very proud of myself and it increased my self esteem (he didn't think i was ugly, didn't laugh about my body and didn't hurt me!). I think maybe the first step is connecting to your own body. Ptsd is primarily a physical and neurological injury. So it is essential to incorporate physical approach, too. Things like yin yoga (a type of slow and relaxing yoga-videos on YouTube ), Tai chi, somatic experiencing (video course can be googled), strength training, walking or jogging. Mindfulness is great for me. Read a book Full catastrophe living by Kabat-Zinn. Then find body scan meditations on YouTube. Be active on this forum, join fb groups about ptsd. Be gentle with yourself and be prepared that this will take time. That's OK. The most important thing in this is feeling your pain and making peace with the past AND getting pleasant and positive experiences in the present. Both are important. Don't deny the past and allow yourself to cry and be angry in a safe way. Get those emotions out! Write angry letters, tear papers, punch your pillow, imagine beating and kicking your abusers. Or imagine the stressful situation in your mind and then physically run away from it. You must allow your body to finish the fight or flight reaction it couldn't finish in the past. So go to your room and do those fight or flight movements with your body and imagine alternative ending to your trauma. This will heal your brain and release the stuck energy. Do this for only a short time and only as often as it won't be too stressful! It's better to do less!!! Be gentle with this and stop when it's too much. Every day go and do something very relaxing and calming and enjoy the present. Repeat many times slowly and gradually. Connect with your friends and enjoy your time with them even when you don't feel like it. Get artistic! Music is healing, too. Do some nice skincare routine, dress nicely, try a new perfume. Eat something healthy and tasty. These seem trivial but it's extremely important to experience small joys every single day and connect to life in all your senses and creativity! The healing will take a long time but you'll feel better eventually. I can relate to much of what you are saying. I have CPTSD and Autism just to keep things interesting. I have worked with a lot of therapists and in a lot of different modalities... all a useless waste of time and money. I now have a new T I think will help but after twenty+ years of searching I can say they are hard to find. The #1 biggest help for me was one person. That one person I was terrified to get close to (like everyone else) but who haunted me because I wanted to know them SO bad. After a night of sobbing, screaming, throwing up, shaking, pacing... you name the anxious behavior... that next day I stumbled to their office falling several times because I was so scared. I told him I had a hard life and was afraid of him but I didn’t want to be. Then I ran back to my room and hid for three days sicker than I have ever been in my life. A week later I ran into him and he gave me my space but smiled gently and waited until I was my normal level of anxious. Then we got through it together. Once he was ok then there was a second... 18 years later I think I am up to a whopping 5 people including ones I haven’t seen in 10+years but keep them on the roster to keep my spirits up. Yes, this is me. No money for therapist, sick spouse, sick self, drowning in medical bills. Thanks for the reading suggestion. I’ll be applying for a library card, since we moved to another state in May. I know, it’s taking a long time to settle into the community, a lot due to constant medical crises and hospitalizations. Maybe the book is available at the local library. I also struggle with making friends and meeting people. I have joined some online groups, tailored to support for various medical conditions, but they aren’t tailored to the issues of C-PTSD, and one doesn’t dare make the mistake of baring the soul about this affliction and assault, Flying Monkeys, and such. Besides being off topic to share the C-PTSD, it isn’t something the average person has any understanding, can’t help us anyhow. Judith Herman has been widely regarded as the first to acknowledge the existence of Complex PTSD and lay the foundation for what little is known. Her book is as amazing as Pete Walker's book. In terms of your NOT having access to treatment, it may be a blessing in disguise. While therapy can be effective for many people, it is not always helpful for those of us with Complex PTSD. Retraumatization is a real risk and unfortunately modern-day therapists are not trained well enough in Complex PTSD as it still hasn't been widely accepted by the healthcare community. Apparently there are a variety of reasons why (including that including complex PTSD in the DSM would rid of nearly half of the diagnosis's, and thus cause severe issues for the Pharmaceutical companies). For example: Why diagnose someone with Complex PTSD (the root of the problem) when they can diagnose someone with ADHD, Borderline Personality Disorder, Clinical Depression - and make money off prescribing drugs. Healing comes down to balance. Acceptance that you have PTSD (which is physical brain damage), goes a long ways in allowing yourself the room for good and bad days. Some days our body is riddled with physiological symptoms, other days we are able to carry on with life as though nothing happened at all. We may go months without a problem only to be surprised by something we did not identify as a trigger. The frustration with having both good and bad days and desperately wanting good can get us down; the importance is that we can accept that this is part of us now. Those who heal find a way to harness the trauma and use it to make the world a better place in whatever small way(s) they can. Advocacy is one method of healing. As is volunteering. Spreading awareness and finding purpose in the trauma - that it is NOT for nothing. Use it to change things and prevent it from happening to others. THAT is the key to healing, but first you need to focus on building inner safety and resiliency before you can help others. You must help yourself before you can help others, right? "stand for those who are forgotten - sacrifice for those who forget"
"roller coasters not only go up and down - they also go in circles"
"the point of therapy - is to get out of therapy"
"don't put all your eggs - in one basket"
"promote pleasure - prevent pain"
"with change - comes loss"
What are the distinct differences between severe ptsd and complex ptsd? And why would it rid half the diagnosis's? I highly doubt that Pharm companies are banking on keeping complex ptsd from being recognized in order to make their money. There is plenty of money to be made in the mental illness industry. You really believe that the power of the drug companies is somehow squashing c-ptsd to make money off of the above conditions?? Complex PTSD is a condition that can only be treated through trauma therapy. However, you may be able to manage your PTSD by reading books on the topic and gaining empathy from this wonderful community. 1. Sleeping, eating and exercising properly will cut down 30% of your symptoms. 2. Self talk- tell yourself 'I love you' 'I can succeed' 'life will get better' etc. 3. Practice mindfulness of your body sensations, somatic experiences and thoughts and feelings. 4. Belief in a higher being. Thanks for the reply, I just saw this post. These are many theories that I have heard about the healthcare profession. The Pharmaceutical Companies play a MAJOR role in so many aspects of healthcare, including the Diagnostic Statistical Manual and financing of Research Studies. Research studies which (according to many) hold major conflicts of interest when it comes to findings and trying to control and influence the American Psychological Association into a puppet for making money. It is one big cyclical mess and that is a big rabbit hole to research. Once again, this is a topic of research and I highly recommend doing research about this on your own. There are many professionals who wanted Complex PTSD to be included in the DSM 5, and are upset that it was not. Just look up, "Complex PTSD not in the DSM 5," on google and you will find all kinds of theories. Look up the difference between Complex PTSD and PTSD. There is plenty of overlap but they are different diagnosis and more and more professionals who work on the front-lines are seeing a clear distinction. Also, there is plenty of literature about the complexities and common misdiagnosis of Borderline Personality Disorder instead of Complex PTSD. Look at the symptomatology, they are very similar. Both have abandonment and attachment traits, anxiety and fear, self harm and suicidal ideation, both can have trauma backgrounds and or flashbacks / physiological responses to triggers and stressors, age regression for coping, both can have all or nothing / black and white thinking indicative of generalizations cause by traumatic experiences. All of this and more. There is added confusion about the similarity between Complex PTSD and Borderline Personality Disorder and how that could interfere with common therapy modalities and the money making industries like Big Pharma. LOADS of money would be lost if some of the diagnosis in the DSM were abolished in favor of simple trauma theory - as in, instead of treating someone for the SYMPTOMS of an addiction problem (or any illness for that matter), with medications and or extremely expensive and intensive programs, they would instead treat the underlying trauma that brings people to addictions in the first place. (This would rule out the need for extraneous treatments). The theory being that the majority of addictions stem from abuse and trauma / PTSD - and that making this change would rid of a lot of alternative treatments, which would decrease the amount of money for pharmaceuticals. Of course, this isn't just for addictions, it is just an example. Last edited by HD7970GHZ; 02-23-2019 at 10:36 PM.